There is still one more day for ISTE but today was the last day for me. My brain is full and I am tired so I am ok with missing another day. ISTE is a huge conference. There are many sessions, a gigantic exhibit hall and 13,000 attendees not counting the thousands of people working the exhibit hall. Is it too big? That is a question I asked myself several times over the last couple of days. This year there seemed to be lines everywhere. Not just for the food concessions or the ladies rooms either. I got locked out of several sessions because there were more people wanting to get in than could safely fit. I heard more than a few people complain about lines and missing out on sessions. This (Georgia World Congress Center) is no small venue either. There are something like 3.9 million square feet of conference center here. For me ISTE is about three things: The sessions, the exhibit hall and the people and personal connections. That’s pretty much in reverse order. I attended some sessions that were pretty good. I was impressed by Microsoft’s sessions which while as much marketing as a session in the exhibit hall as anything were presented by teachers who use and know how to use the tools. For me the big problem with sessions is the shortage of Computer Science related sessions. But I go to the CSTA conference and SIGCSE for those sessions anyway. Have handouts that explain a lot and link people to still more online. QR codes on your poster are all well and good but people really want to look at your website later. So create a handout and put the QR code andor a URL on it with enough information so they remember what they are looking up. Don’t just talk to one person. It can be very easy to get wrapped up in conversation with just one person with the result that others don’t think you have the time to talk to them. Exhibit hall discussions can be longer, often, because companies put a lot of people in the booths to talk to people. If you are the only one then you have to work at making sure you get to talk to a lot of people. Schedule a later face to face meeting if there is real interest in going deep. I know people who wish there was no exhibit hall at all. They see it as too commercial and marketing oriented. Even if you ignore the fact that exhibit hall fees are a huge part of making the conference affordable there is a lot of potential value from the exhibitors. Yes there are some companies that are all about making the sale. That is human nature. But I find that most companies, and especially the people they send to conferences like ISTE, really believe they have products that make education better. Some of them may even be right. You will not know it without talking to them though. You may get some good ideas even from the worst of them. It’s been known to happen. Best case you will find something that will make a real difference in how you teach. I enjoy the exhibits. Last but far from least are the people. There are a lot of people I communicate with and learn from all year long via social media. Even a short face to face meeting makes that ongoing communication much better. It builds relationships that last more than many might think. Face to face is high bandwidth communication as well. You can really learn a lot in a short period of time face to face. With ISTE being so large both in venue and numbers of people I didn't get to connect with everyone I wanted to talk to. But I sure did connect a lot. And that makes all the difference. So much of what makes a conference for me is the people. I’ve missed the last two ISTE conferences and it has been a while since I have seen a number of people who I interact with online in person. Today was a day to reconnect in real life. New for me this year is the selfie. I've taken several with people. The one on the right is with Steve Dembo of Discovery Education. We caught up at the Blogger’s Café early today. It was great to catch up with him. And with too many others to mention. I spent the morning in the exhibit hall. There were a lot of 3D printers and robots. I've seen robots in previous years but the explosion in 3D printing is new. I think we’re still early in that but the move towards getting students making things is going places. Of that I am sure. On the computer science side the Alice program from Carnegie Mellon had a booth this year. Don Slater was manning the booth and it was encouraging to hear him talk about how people were already using Alice and looking for more ways to use it. That’s exciting. Python, the programming language, was present a lot this year. Grok Learning has an online tool (not free) that evaluates code and reports back on errors. It has some similarity to some project from Microsoft Research like Try F# (http://www.tryfsharp.org/), Pex 4 Fun(http://pex4fun.com/Page.aspx#learn/) and more recently Code Hunt (http://www.codehunt.com/) It’s not free like the Microsoft options are but there is support and it is designed for teaching so I may look at it some more. Exploring Robotics has an “Exploring Robotics with Python” curriculum that uses a Scribbler robot. Combining programming and robots seems to be a common theme at ISTE in the exhibit hall. I may look into that idea some more. Kids like seeing things move and do things. At the Computing Teachers Network forum (used to be SIGCT) I saw the Nao robot from Aldebaran up close and personal. It can be programed using a number of languages and also a drag and drop system called Choregraphe. That system is built on Python and Python can be used to create new objects and commands for Choregraphe. It is expensive though. So many things are, probably not surprisingly, not free and some costs add up quickly. But then a lot of the best things in education do cost money. I actually got here on Friday but things started for real this afternoon. More or less. I was not able to get into one big session of mini talks because the room (and overflow room) filled up. Poor planning I think. I was not impressed by a very long line outside a door that apparently didn’t open until minutes before the session was supposed to start. On the upside, that caused me to go to my backup session. I spent some time in a group with Vicki Davis (AKA Cool Cat Teacher) talking about a student directed MOOC project. I’m not sure I would call it a MOOC the way many think about it but it was interesting hearing about anyway. One of the end results of the project was evaluations of some 70 “educational games.” You can see some of the project including the evaluations at http://gamifi-ed.wikispaces.com/ A good use of a wiki. One of the conclusions that her students came up with was that most serious games were either educational or fun. very few were much of both. This is not news to anyone who has been paying attention to research on serious games. I heard much the same thing at the Games 2 Learning Institute in NYC two years ago. Thought honestly to hear about 9th graders coming to the same conclusion after their own independent research was reassuring to me. I’d like to see more students work on their own educational games. They know about about what fun is like at least. And they also know when they are learning or not. Talking about student initiated learning. I talked to Vinnie Vrotny for a while about the maker spaces he has been setting up in schools. Wow! Kids are getting fired up making things across the curriculum. I hope to get some more ideas along this line over the next couple of days. The opening keynote was by Ashley Judd and I’d tell you all about it except I skipped it. I’m sure it was interesting and all but nothing in the write up make me think it would be worth waiting for an hour in a huge line to hear. I would rather have had Hadi Partovi from Code.Org give a keynote. ISTE needs to move a little back to its roots and do a lot more to encourage computer science in schools. The cartoon below by Hugh Mac­Leod is one of the most shared of his images on the Internet. I have to say I see something different in it every time I view it. Recently I saw it as showing the difference between teaching a programming language (information) and teaching how to program (knowledge). Teaching a programming language is easy. Really it is. The hard part is helping student make the connections and putting something together that makes sense. As I though more about it though I realized that helping students turn information into usable knowledge is what all good teachers do regardless of the subject they are sharing with their students. 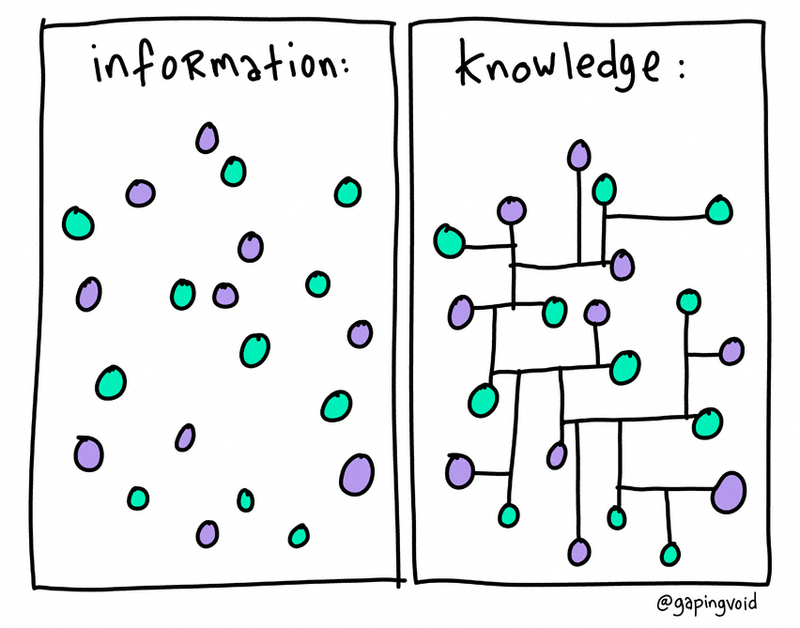 Information, they say, is power but real power is using that information in a knowledgeable way. Lists of names and dates are really just trivia. Interesting but not useful alone. What is useful is knowledge about what the events and actions around those dates and people did to change the world around them. I’d like to close with one other of Hugh’s graphics that I like. I may have to get a print for my computer lab. After all, changing the world is what I am counting on my students to do. Click the image to read the backstory behind the Microsoft Blue Monster. One of the links in yesterday’s interesting links post was to a fun questionnaire for computer science people. Guess the Programming Language asks you to identify programming languages from a small snippet of code. two of the languages in the questions were pretty far out and more joke than useful. I’ll ignore them for the time being. But several were pretty recent real programming languages that are being promoted as new and special. I have to say though that a lot of them look a lot a like. At some point one had to work fairly hard to find the unique attributes or syntax between languages. Most of them seem to have a large volume of “stuff” that could be taken right from the definition of the C programming language. Other features, or rather syntax changes, seem to be attempts at obviating the need for the use of letters. OK none of them take it to the extreme that APL did. Am I the only one who remembers this sort of keyboard overly for entering APL programs? Did no one learn from that? It feels like the early days of programming saw languages that were really different from each other. No one would confuse a FORTRAN program with a COBOL program or a BASIC program. Let alone APL. Java, C++, C# and more in the C family all look largely alike for the basics. One sort of wonders why people bother creating new languages if they are not really different. Another thing I have noticed is that while there once was a goal of making programming languages easy for people to understand it seems increasingly like one goal is to make them easier for compiler writers (or at least the people who write the parsers). The use of special characters seems to be going way overboard. Maybe that is through back to or because people didn’t learn from APL? I don’t know. One thing this has done is encourage the use of block programming languages for beginners. While an (mostly) good idea this makes the jump to more professional languages into a big step. What’s an educator to do? School’s out for the summer! Not that I haven’t been busy doing a lot of stuff I just haven’t had time for during the school year. And this week I am getting ready to go to the ISTE conference after missing the last several. I am really looking forward to seeing people, attending sessions, and scanning the exhibit hall for new ideas. Look for me if you are there. “The job gap and growth opportunity is in computer science, not STEM" is the comment with the following graph found at the Code.Org blog (What % of STEM Should Be Computer Science?) We are not facing a STEM shortage as much as we are facing a CS shortage. Small-Group Code Reviews for Education recently on the blog@CACM via Communications of the ACM. I keep saying I’m going to do code reviews with students but I haven’t done it yet. This fall for sure. I found a fun questionnaire for computer science people. Guess the Programming Language. Give it a try. Warning one of the languages has a name that may not be “safe for schools.” There are a lot of the newer languages and fewer of the old favorites. Hint: COBOL and FORTRAN are not correct answers (or even options) for any of the questions. How well do you do on it? What are you doing this summer? My latest post on the CSTA blog. Why Computer Science Needs Women This article is from Marie Claire which is not your typical geek journal! Well it looks like Google is jumping into the effort to get more girls interested in computer science in a big way. Their new program is called Made with Code. $50 million is a lot of money. It will be interesting to see both how it is spent and how it works. Code tells a story. When I hear someone talking about telling a story in code I tend to think of tools like Alice, Kodu and Scratch. After all those are tools with lots of pretty pictures and commands that seem to scream “use me to tell a story.” But really any program tells a story of one sort or another. Take for example this bit of code. There is a story here. The story is a simple one. Let’s make the dot blue if it is red and make it red if it is blue. It’s part of a larger story of lets manipulate some dots on a form to make it look like they are rotating around in a loop. Like any good story it has characters. In this case the characters are a bunch of dots that can either be blue or red on color. The dots don’t actually move in this story but the pretend to move by changing colors in a synchronized manner. We have a plot of sorts.It has a beginning – a button is pressed. Every fraction of a second a dot takes on the color of a neighbor dot in a pattern. There is an end to it – the button is pressed again or the program is terminated. OK it’s not much of a plot but then it is a simple program. Larger more complicated programs have larger more intricate stories. A book piece of software even has a back story based on the types of people who will use it and what they need it to do. Some development groups layout these backstories and great detail with names and descriptions of different types of users to keep in mind during the development. At any point while reading a piece of code one can ask “what happens next?” and “how did we get here?” What is this character (variable, method, data structure) and how do we expect it to act? What are its traits? What is its reason for being? Have we described it carefully enough so that it can act out its proper role in our story? Does our story hang together and make sense? Part of teaching programming is teaching students how to tell the story in code. And to understand the stories someone else has written. This is not the normal, natural language, way of storytelling but that doesn’t mean there isn’t a story there. I’ve seen several variations of the image below over the years. The last time I saw it I decided I’m going to use it with my computer science students next year. I suspect that most people can read that. Some may struggle with some parts of it but once you get rolling your brain takes over and deals with the misspellings and sees what it wants to see. Computers are not very good at that. Generally one has to do something specific before software recognizes that uppercase and lowercase letters mean the same thing. Or at least close enough for most applications. I think this will serve as an example of a couple of things. Obviously how well human minds handle things that are not quite the way they should be but also how difficult it can be for computers to parse what humans mean by what they say. I’m hoping it will lead to some interesting discussion. What do you think? I shared the image below on my Facebook page last week. As I write this there are ten “Likes” and nineteen comments from my friends. Over how curly braces should be formatted? Yes. Computer science people will disagree on almost anything. The style on the right is the original Kernighan and Richie C book style. The style on the left makes it easier to line up the braces and for many, including me, that makes the code easier to read and to debug. There are people who argue for each style and make good if difference cases for their style. And then there are people who suggest languages, Visual Basic and Python came up on my Facebook page, that don’t use curly braces at all. So who is right? Probably everyone. And no one. The discussion is interesting either way. In fact one of the things I have long appreciated is that in software there are almost always several ways to accomplish anything. A lot if left to personal opinion and what works best for the way the individual thinks. Companies usually have set standards because regardless of personal preference consistency makes life easier when working on a team. Deciding on standards when creating a new organization gives people a chance to work out their own ideas and come to agreement (or at least acceptance) of a common way of doing things. That can be a useful process. School is out! Well after lunch today school is over for the year for me and my school. I’ll miss the kids over the summer but I’m ready for a break. I plan to work on my curriculum over the summer though. I’ll be blogging about some of my ideas over the next few days and as the summer goes on. I’m definitely going to make more videos though. See Office Mix and Binary Numbers for some of how I’ll be doing it. CSTA Annual Conference Reminder – time is getting short. I’ll be there. Hope to see many of you there as well. 14-year-olds find manual online, hack an ATM during their school lunch hour Can you imagine that? You have to hand it to those kids for initiative and for doing the right thing with what they learned. A good topic of conversation for the future. There was a lot of media excitement last week about a computer passing the Turning Test – fooling people into thinking it was a person. But it turns out No, A 'Supercomputer' Did NOT Pass The Turing Test For The First Time And Everyone Should Know Better Artificial intelligence is another great topic for discussion in class. The term "undocumented feature" is a humorous term for something that was not planned in software. OH for sure there can be features added to a product that are not documented. Easter eggs are a notable example. But generally the term undocumented feature is used to down play something added by error. When I ran into this image last week I was in a bit of a philosophical mood though and saw more to this cartoon than a bug calling itself a feature. One of the things I worked on this year was sharing resources with students. I uploaded all my PowerPoint presentations to our learning management system for example. And I created some video demos which I loaded on YouTube and linked from our LMS as well. I did see students using the PowerPoint decks for review which I think helped some of them. What I was really wanting though was something better. Something more interactive. I may have found it. I’m in the customer preview for something called Office Mix which works with PowerPoint to let you record presentations, add video, and quizzes and other things. Basically it lets you do a lot with PowerPoint and mixed media. One of the things I wanted to do was to record presentations, which I could do with various tools already, but add more. Specifically I have long thought that it would be great if students who were watching the videos on their own could check their knowledge. Office Mix lets you add various types of quiz questions to a presentation so that viewers can do just that. My learning project was an introduction to binary numbers. It includes me speaking to a (pretty good if I say so myself) set of PowerPoint slides with some quiz questions after two sections. Just something to give students a chance to try things themselves. I’m looking at a bunch of my presentations to see if I can do more of this over the summer. The idea that kids can replay my talk and not just review the slides seems like a real positive. The only downside is that it requires PowerPoint 2013 and right now I just have a 180 trial version. May have to see what the school’s budget is for upgrading me is like. The latest announcement from code.org hit my email inbox yeterday. Looks like they are planning for a bigger better "Hour of Code" for CS education week this fall. Thanks to educators like you, last year's Hour of Code movement just keeps growing. By now, 37 million students have tried computer science for the first time with the Hour of Code! We hope to make this December's campaign even BIGGER. So before you leave for summer,mark your school calendar now for the Hour of Code 2014, coming December 8-14. Free, one-day curriculum workshops for elementary teachers beginning in September -Sign up to be notified when a workshop is scheduled in your area. Check out our current courses for a preview of what's to come: all free, open source and available worldwide. I can't wait to share more Hour of Code news this fall and together hit our goal of reaching 100 million students by the end of the year! The Advanced Placement Computer Science exam was graded last week. Well the free response part was anyway. I had a number of friends there and got some news from them. There was also some APCSA 2014 Exam info from Trevor Packer (via Twitter) [collected by Jim Huggins and posted to the APCS mailing list] which I have copied below. Besides the Google funded efforts I know that the TEALS program (Sponsored by Microsoft) put a lot of industry professionals in classrooms to help teach APCS last year as well. So industry is starting to step up their support. I think that is a great thing. American schools are showing real commitment to helping students learn computer science: participation in AP Comp Sci grew by 33% this year. Google funded the creation of AP Computer Science courses in more than 100 schools this year where female & minority students lacked access. 2014 AP Computer Science scores: 5: 20.9%; 4: 23%; 3: 16.9%; 2: 7.7%; 1: 31.5%. These may shift slightly as late exams are scored. Given the difficulty level, it's rare to see a perfect score on an AP Exam, but when we do, we notify the student & teacher in the fall. We're seeing the first perfect scores on any AP Exam so far this year in AP Computer Science: 9 students earned all 80/80 pts. AP Comp Sci students scored very well on mc questions about object-oriented programming, but still struggled on data structures. Someone mentioned in a comment somewhere (I wish I could find a link) that sometimes they create a project for students that they haven’t built themselves first and find out that it is harder than they expected. I sure can relate to that. I’ve done it more than a couple of times. Now normally I like to assign projects that I have already coded at least once. Failing that I like to use projects that I know other people have used with students at the same level. But sometimes I get creative and adlib something. Typically this comes as a result of a conversation with students during class. It usually involves me saying something like “Let’s try this.” Sometimes it works. Sometimes it even works well. But sometimes things turn out to be a lot harder than they first appear. I’m not sure this is necessarily good or bad. When it results in the students and me both learning something new that can be good. If we have fun doing the learning so much the better. When it results in a lot of frustration and misery that is not a good thing. Not for me and not for the students. One could avoid that by always taking the safe way out – use tried and true projects only. Or perhaps wait until the instructor has a chance to code up a sample solution first. But if you do that you risk losing a special teachable moment. Plus I like to live a little on the edge. I learn a lot from watching students work on projects. Even if I have done a project before and think I know all the things that can go wrong an inventive student will often find a new way to mess things up. And that is fine. I learn. They learn. We both win. Having done the project before either on my own or by helping students makes it easier to make sure all the required techniques and tools are taught before assigning the project. And there is nothing wrong with that. Trying to code a project myself usually helps me determine how long it should take students to complete the project. Sometimes I even calculate it correctly. But having students do it is really the most reliable way. It makes for interesting scheduling and lesson planning when you get it wrong of course. In high school one can’t often expect students to put in many extra hours outside of school as one would at the university level. So there are advantages to getting the timing right. So much is about trade-offs though. There is value in spontaneity and in creating spur of the moment projects that students are really interested in doing. And there is value in having clear schedules and stable projects to assign. Generally I find some balance and that seems to work out. Recently Mark Guzdial had a post called High school CS teachers need to read and trace code, not develop software that got me thinking along some new lines. Working with students on their final projects and some other online reading lately has me thinking even more about what is involved in becoming a real developer of software. Some claim that once you write your first code you are a software developer. Seems a stretch to me. I’ve replaced a few pipes and made minor plumbing repairs but that doesn’t make me a plumber by any means. As a teacher with limited time for teaching I can teach only so much. I teach some important concepts that software developers need to know for sure. Loops, decisions, variables, and the general basics. Students can write simple programs with what we cover even in a short part of a semester that we dedicate to that in our first course. That doesn’t make them developers though. Not in a real sense that means someone should hire them to write code. Developing software is more than just writing code. It means writing code well. Let me jump back to plumbing for a minute. I replaced an l joint under my bathroom sink. It sort of worked by which I mean it only leaked a little. I knew the basics but my implementation left something to be desired. I hired a real plumber to fix that and some other work that, thankfully I knew were beyond my skill, and there was quite a difference. No leaks for one thing. For an other thing it all looks nice and neat and clean. My depth of knowledge was not enough to do a professional job. This is also true with programming. I printed out a student program to play a game called lights out (instructions at the bottom of this post). It went on for about 20+ pages. The version I wrote too barely 2 pages. Why the difference? Experience mostly. There was nothing in my code syntactically that the student hadn’t learned. But the experience to look at a problem and see that there are different ways of doing things was not there for the student. Students took days and days to complete their Lights Out games. It took me a bit over an hour. That’s not a brag. It’s what happens when you have decades of experience. When I looked at that program it screamed two dimensional array with “buffer” items around the edge to simplify operations. I’ve seen that sort of thing many times over the years. I see a group of items while a beginner generally sees 25 individual items that have to be handled individually. Could I have taught what I did to students? Of course. Should I have? Probably not with the time I had and the priorities for what needed to be taught in the time available. In fact for each of the projects my students selected for their end of year projects (there were quite a variety of them) there is probably a technique that would have helped them create a more efficient and better running program. They could probably have saved time as well. But I didn’t have the weeks it would have taken to cover all those techniques. What do we want to cover in a first programming course? The basic concepts of course. We want students to understand loops, decision structures, data storage, and the logical thinking behind all of this. That is computer science – at least a small subset of computer science. We’re not making them software developers though. Not by a long shot. 3. Lights Out – The game starts with 25 red buttons arranged in 5x5 grid. Each button pressed toggles itself and the four buttons around it (above, below, to the right, and to the left) between green and red. The object of the game is to get all 25 buttons green. Moving From "CS for a Few" to "CS for All" to "CS For Each"
In case you are not a CSTA member (why not?) and didn’t get the email this looks pretty interesting. In a new twist for 2014, CSTA is thrilled to invite you to our first ever virtual summit in conjunction with our annual conference in July. As an online participant of the Computer Science Principles Summit you have access to presentation slides, handouts, and supplemental resources as well as the ability to interact with attendees participating virtually and on-site. This is free professional development for CS educators made possible by enthusiastic support from Google. There are just a few simple things you'll need in order to take full advantage of our online summit experiment. The day of the conference, use your laptop, tablet or smartphone to access polls, handouts, slides, and the interactive video stream. It all starts on the CS Principles Summit website. Afterward, stay in touch with CSTA through social media on Facebook, Twitter, LinkedIn, and Google+. Review recordings of the sessions on the CS Principles Summit website, too! My students are wrapping up the year with final projects. For the most part these are great learning experiences. Sometimes though students get hung up on the wrong things. For example, students can spend a lot of time getting things to look just right when what they should be focusing on is coding functionality. One of my students is working on a game using XNA that involves collisions and showing explosions. He’s not happy with how the explosion graphic looks. Now if this were a game that was going into production that would be a serious concern. But for a final project where the code is the thing how the images look should be a later concern. Getting that message though can be difficult though. Human nature makes us want that which is visible look its best. This is a common problem with projects that involved a graphical user interface. In other projects during the year I sometimes get around this by providing the GUI and asking students just to write the code. If they want to make the GUI “pretty” later I will let them but they have to have the code first. There are also times when the focus is on “the right thing” but gets too narrow. For example I had a student ask me if there was a way in code to ask if something was NOT GREATER THAN OR EQUAL TO. I suggested LESS THAN. He was so focused on looking at the problem one way that he missed what should have been obvious. That is a common problem even for the most experienced software developer though. That is why pairs programming (which I tried some this year) is becoming more popular. Even explaining a problem to someone else often makes the solution appear. I keep thinking of an old saying “Though shalt not perspire minor matters.” I’ve heard it “don’t sweat the small stuff” as well. Sometimes it is hard to remember what is the small stuff and what is the big stuff. My student with the image issue had it wrong though only for that project in that context. But in programming sometimes the small stuff really matter. For example is “=” to comparison operator or is “==” the comparison operator? Different languages do it differently. A small character but a big deal if you get it wrong. Often times one can focus and focus on an if statement and totally miss the missing character. That is where a second set of eyes can help. For beginners the problem of a sort of tunnel vision can be devastating as they focus on the wrong thing or so hard that they miss things by being too close. A teachers job is often to help them refocus a bit. That is just one reason I think we’ll always need teachers for most students. I’ve had some fun with a line from the movie The Princess Bride and meme generator below inspired by working with students. Programming is so non intuitive for many students. An equals sign doesn’t mean what they are used to and then we confuse it in some languages by having “=” and “==” mean different things. And that is just the start of the problem. I find myself asking students “what do you think that code does?” in order to understand exactly what problem they are trying to solve. I used to tell people that I liked to blog because I knew that classroom teachers didn’t have a lot of time to look for things. As the school year comes to a close and I am a classroom teacher I am finding the truth of that. My blog production is diminished the last few weeks. And I was sick over the weekend so even this post is late. So lets start with some fun. People have started a crowd funding effort to raise money to make Born With Curiosity: The Grace Hopper Documentary Hard to understand why there hasn’t been a movie made about her life yet. KIDS REACT TO OLD COMPUTERS The kids are shown an Apple ][ some of us remember when that was the state of the art in school computers. The video is worth showing students so they can see how far we have come. Google Computer Science for High School programs from Google regarding CS in high schools. Do programmers still need a computer science degree to land a great job? Good question. What do you think? Recently on the CSTA blog - Moving From "CS for a Few" to "CS for All" to "CS For Each"